CLARION, Pa. — It’s back to the state playoffs for the Clearfield Bison, who take their 12-0 record into Friday night’s PIAA opener against District 10 powerhouse and two-time defending state champion Erie Cathedral Prep at Clarion University’s Memorial Stadium. The Bison won their first Sub-Regional title since 2013, which was the last time they also went into the PIAA state bracket and in Class 3A that year, they reached the quarterfinals after beating District 4 champion Jersey Shore (27-8). Berwick ended their season with a 44-7 decision, then went on to lose to eventual state champion Archbishop Wood in the semifinals. It’s a different state bracket setup for the Bison in Class 4A. Rather than going east out of the gate, the Bison have to deal for the first time ever with the 9-3 Ramblers who routed University Prep out of the Pittsburgh City League 52-8 in last week’s sub-regional game after dumping Fort LeBoeuf 42-12 in the D10 finals two weeks ago. Friday’s winner advances to the state quarterfinals against the WPIAL champion. Thomas Jefferson and South Fayette meet Saturday at Heinz Field at 5 p.m.
Prep has some impressive history. The Ramblers won the last two state titles with unbeaten records, lost in the final 2015 and had an unbeaten run to a state title in 2012 as well. They also won the state title in 2000 and lost in the finals in 1999 and 1991. They brought a 28-game winning streak into the season and had it snapped in the opener in a 24-21 loss to Class 6A Central Catholic, which was knocked out by Seneca Valley in the WPIAL quarterfinals. Head coach Mike Mischler is 181-42 in his 17th season overall. It’s his second stint, which started in 2009 after he coached from 1998 through 2004. The Ramblers play mostly a non-PIAA school schedule — three from Canada, two from New York and two from Ohio. The only other games in-state were against Erie rivals McDowell (45-6) and Erie High (28-9). Their other losses were to St. Edward, Ohio (35-3) in their third game and Clarkson Football North of Canada (51-40) on Oct. 26. The Ramblers, who have dealt with some key injuries through the season, average 441 yards per game offensively — 282 rushing, 159 passing — and have a 1,000-yard rusher in senior Billy Lucas (144-1,131, 15 TDs). He’s missed three games, but ran for 172 yards on 20 carries with two touchdowns against University Prep last week. Senior Connor Schleicher and junior Collin Johnson have both thrown for over 800 yards at quarterback. Johnson threw for all of those yards in the team’s first five games. The Erie-Times News on its www.goerie.com website reported that Johnson along with some other starters were getting closer to returning to the lineup. Johnson did not play in last week’s blowout win, however. Schleicher has thrown for 912 yards (66-for-129) with 11 TDs and three interceptions while also running for 585 yards and eight TDs. Johnson (48-for-76, 815 yards, 12 TDs, 1 Int.) is also a running threat with 303 yards and four TDs. Lucas, also a standout defensive back, was injured going into the game but did wind up playing while Joey Scarabino, another key defender, has worked his way back from injury. Juniors Luke Sittinger (59-571, 6 TDs) and Jaheim Howard (39-423, 2 TDs) have also gotten carries. Junior Jack Oedekoven (32-581, 7 TDs) is the Ramblers’ leading receiver. So it’s clear that it’s the biggest challenge of the year for the Bison and head coach Tim Janocko, who’s coming off his 275th career win in his 34th season in last week’s 49-21 win over Bellefonte. 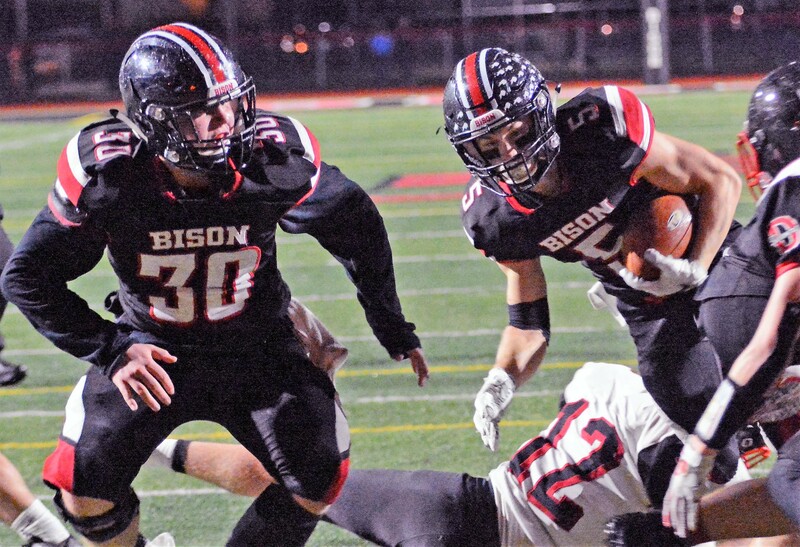 Clearfield will need all of its offensive balance as the Bison average 452 yards per game — 247 rushing, 205 passing. Senior quarterback Isaac Rumery (112-for-161, 2,397 yards, 25 TDs, 3 Ints.) runs the unit and he’s also the third-leading rusher (80-555, 12 TDs) behind junior running back Brett Zattoni (154-1,015, 13 TDs) went over 1,000 yards last week while senior Caleb Freeland (120-961, 21 TDs) is closing in on the milestone as well. Sophomore Jake Lezzer (44-1,024, 9 TDs) and senior Taye Lynch (40-887, 12 TDs) are Rumery’s top receiving targets. Defensively, the Bison are led by leading tacklers in seniors Jude Pallo (6.3 per game), and Spencer Graham (5.9), and freshman Oliver Billotte (5.6). Lezzer and Lynch each have four interceptions.